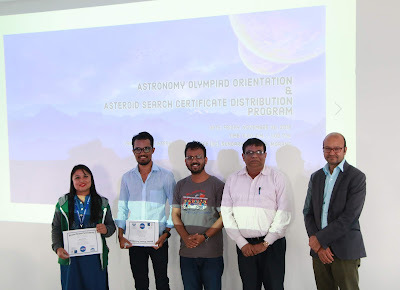 All-Nepal Asteroid Search Campaign, September 3-30, 2018 was primarily focused at the province one concluded with sixty-four preliminary discoveries! The discoveries were made by the seventeen teams of the students from six different schools. During the campaign total of ninety preliminary discoveries were made by participants where thirty-three discoveries were done by our members/volunteers at different parts of Nepal! Photo 1: Students and teacher from the Delhi Public School, Dharan receiving certificates from Mr. Gobinda Thapa, Itahari International College, Morang. Photo 2: Nepal Astronomical Society (NASO) and Itahari International College (ICC) officials during the ceremony. Ms. Sayari Neupane, one of the participants at the campaign and class XI student at Eureka Secondary School, Dharan shares, “It was really a great experience of mine in participating in all asteroid research campaign. Our team learned many new things. It is really a good platform for those who are interested in astronomy. This program taught me new and unknown things about astronomy. I was unaware that many types of research in astronomy are done through a computer or a laptop. 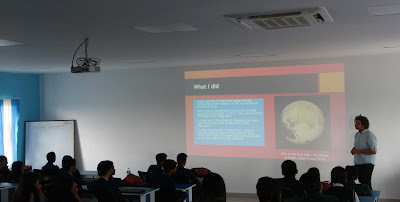 But by participating in this program, I learned the use of technology in astronomy. I recommend this program to everyone who is interested in learning new things”. During the program, Mr. Bijaya Chandra Luitel, absolute winner at the 3rd National Astronomy Olympiad 2016 (NAO2016) and the 4th National Astronomy Olympiad 2017 (NAO2017). He shared his experience participating at the national and international astronomy olympiads. 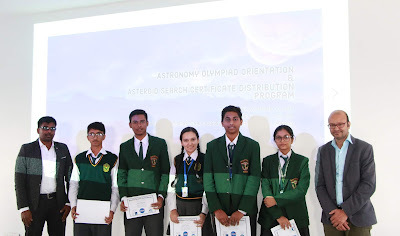 He also provided information on how interested students can prepare for the upcoming 6th National Astronomy Olympiad 2019! Photo 3: Mr. Bijaya Chandra Luitel, the absolute winner at NAO2016 and NAO2017 and Honorable Mention (HM) holders at IOAA2016 and IOAA2017, sharing his experience among the participants. Mr. Luitel received two Honorable Mention (HM) awards representing Nepal at the international level. He participated at the 10th International Olympiad on Astronomy and Astrophysics (IOAA2016), Bhubaneshwar, India and the 11th International Olympiad on Astronomy and Astrophysics (IOAA2017), Phuket, Thailand respectively. Happy hunting and happy exploring!